NEW BEDFORD, Mass. (WPRI) — A New Bedford man is being held without bail on charges he set nine fires in the north end of the city in a three-month span. Jose DeBrito, 30, of Sawyer Street, was arrested on arson charges earlier this month following fires on Myrtle and State Streets. On Friday, police said an investigation by city detectives, fire officials, the District Attorney’s office and the state Fire Marshal’s office led to DeBrito being charged with setting an additional seven fires. July 28: 79 Adams St.
July 31: 475 Coggeshall St.
Aug. 2: 470-472 Sawyer St.
Aug. 8: 140 Hathaway St.
Aug. 8: 78 Penniman St.
Sept. 7: Purity Linens, 405 Myrtle St.
Sept. 30: 231 Myrtle St.
Oct. 11: 149 Myrtle St.
Oct. 12: 245 State St.
Police said DeBrito poured gasoline on the windows or doors of the buildings then set them on fire and, in many cases, remained in the area to watch the building burn. Police said DeBrito was formerly employed by Purity Linens, and one home was the residence of his former girlfriend. The remaining locations appear to have been selected at random, police said, though they’re all in close proximity of his Sawyer Street home. “I’m sure they’re comforted to know they can go to sleep tonight and don’t have to worry about somebody setting their door or their window afire,” said New Bedford Police Chief Joseph Cordeiro in an interview with Eyewitness News. Cordeiro said DeBrito had been a person of interest in the previous fires for a while, but police finally got enough evidence to charge him with all nine of them on Friday. After being deemed dangerous at a hearing on Oct. 19, DeBrito was ordered held at the Bristol County House of Correction. He’s scheduled to appear in court for a probable cause hearing on Nov. 19. “I hope he gets to spend some time in jail and think about all the damage that he’s caused, and possibly families that he could’ve ruined,” Fisher said. TAUNTON, Mass. 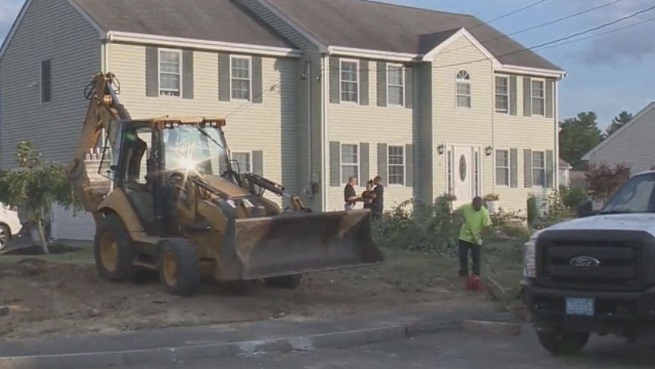 (WPRI) – Taunton police used a backhoe to dig up a front yard on Bryan Drive in Taunton Thursday as part of an ongoing investigation. The Bristol County DA’s office declined to comment on what police were looking for, but said they would notify the public if something relevant was found. Neighbors told Eyewitness News that police arrived around 8 a.m. Thursday, eventually bringing in the large equipment and wrapping crime scene tape around the house. Police said they would notify the public if anything relevant was found. Crews from the town’s Parks & Cemeteries department arrived on scene to remove a large tree from the area where police were digging. Neighbors said detectives were using K-9s to assist in the investigation. Police left the scene around 6:30 p.m., removing the crime scene tape after filling in the hole. Eyewitness News confirmed the people who live on the property where police were digging are not involved in the ongoing investigation. TAUNTON, Mass. (WPRI) — A judge Thursday sentenced Michelle Carter to serve 15 months behind bars, but delayed sending her to prison until after she is able to appeal her manslaughter conviction. The ruling came down after an emotional hearing in which the parents of Conrad Roy III blamed Carter for their son’s death. Judge Lawrence Moniz, who found Carter guilty of involuntary manslaughter in June, sentenced Carter to two and a half years at the Bristol County House of Correction, with 15 months to serve and the remainder suspended with probation. He then granted a motion by the defense for a stay of the sentence, which means she won’t report to prison until all her state appeals are exhausted. Federal appeals will not be included in the stay. Bristol County District Attorney Maryclare Flynn said she was disappointed in the judge’s decision to stay the sentence. Flynn had asked the judge to sentence Carter to 7-12 years in prison, while the defense had requested five years supervised probation with no jail time. Judge Moniz, who is retiring from the court, said the reason he granted the stay until after the appeal is because “the conviction may be reversible, but the time spent in prison is not.” He also ordered that Carter not profit off of her crime in any form, including by participating in a movie or writing a book. Roy, 18, who was in a romantic relationship with Carter mostly through text messages, died by suicide in July 2014 after using a generator to fill his pickup truck with carbon monoxide in a Fairhaven parking lot. Roy’s sister, father and mother presented statements to the judge before the sentencing, describing the pain of their loss and the impact it has had on the family. Carter’s defense attorney Joseph Cataldo argued his client would be better rehabilitated if she underwent mental health treatment, and said she regretted her actions. He also said Carter was hoping to get her broker’s license and become a real estate agent. Carter did not personally address the court. Cataldo said his appeal strategy will be “to argue…that Massachusetts does not have an assisted suicide or an encouragement of suicide law in place,” and also a first amendment argument. The ACLU of Massachusetts has also said Carter’s conviction violates free speech. Carter’s appeal could go all the way to the Supreme Judicial Court, which already weighed in against her back in 2016. During the trial back in June, prosecutors presented thousands of text messages between the two teenagers that showed them planning the suicide. Carter repeatedly encouraged Roy to go through with his attempt, even when he expressed doubts or fears. “When are you doing it?” Carter asked in one of the text messages. Roy responded by asking about Carter’s day. Judge Moniz’ decision to render a guilty verdict hinged on evidence that Roy had exited his vehicle when he started to feel the effects of the poisonous gas, only to be told to get back in by Carter, who was talking to him on the phone at the time. While the actual order to get back in was not documented in a text message, prosecutors presented multiple texts between Carter and friends in which she told them she had instructed Roy to get back in the truck. The defense team unsuccessfully argued that Roy was responsible for his own suicide, and that Carter was “involuntarily intoxicated” by antidepressants when she encouraged him to kill himself. The judge dismissed the intoxication argument as not credible.